required amount of wine and beer. Keep playing guys, only another ten houses to go! for a day of walking, picnic and a few beers in the sun. Picking apples up the road in the Gers. They are untreated fruit so have a few blemishes sometimes, but we left with nearly 30 kilos for half the price of the greengrocer in Trie. 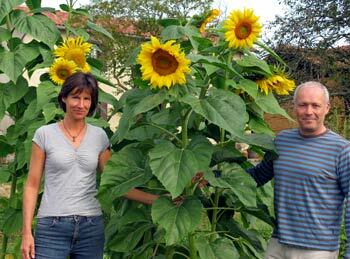 The sunflower seeds Caroline received from our friend Marie in California have grown to be enormous. The heads of the flowers are now drooping with seeds and are the size of large plates. 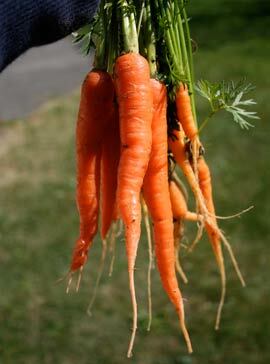 So we'll have loads of seeds for next year. Another couple of years and Caroline can have a small field full. Saturday saw the official boules competition. Meanwhile the tables and chairs were laid out, the bar prepared and the kitchen prepared for the evening's events. The Comité des Fêtes all dashed home and dressed up 'à la Roots', a sort of California flower power look of love and peace, beads, long hair and droopy sunglasses. Perry had a big afro wig on and since he was new to the Comité, hardly anybody from the village recognised him. Some asked Caroline where Perry was for the evening and she pointed to him behind the bar, causing all sorts of 'Oh la la' exclamations and them coming over to say hello. 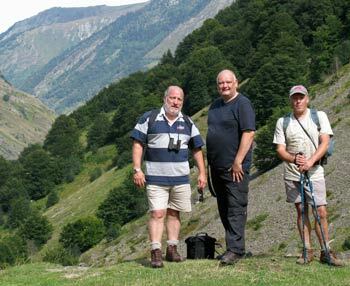 Showing immaculate timing, our friend Austyn and his mate Nick, turned up from England for a boys' week of walking in the Pyrenees. Arriving around midnight, among the well-oiled inhabitants of Puydarrieux in their party regalia, they quickly got in the swing, but we all retreated to chez Taylor about 2.30am in preparation for the next day. On Sunday, there is the Sérénade. This involves a small bus load of musicians and the Comité des Fêtes going from house to house, playing music, having a few drinks, a snack and collecting for the musicians. 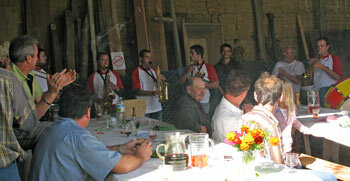 Last year we were invited to Alain and Véronique's. This year it was our turn. Since the small barn had been cleared in June for Perry's birthday, we had little work to do to get it ready again. Popping over to Ernest with the trailer, we borrowed a few trestles, tables and benches along with a couple of barbecues and planchas. Nick and Austyn manned the barbecues as the rest of the guests arrived. Caroline thought up a fantastic array of dishes which we had prepared on the Saturday, such as Chinese spare ribs, lamb kebabs, Toulouse sausages stuffed with prunes and wrapped in bacon and chicken saté. It took some encouraging to get our French guests to try these new delicacies, but once they did, they were hard to stop. The Sérénade turned up and the Comité des fêtes members were all looking the worse for wear, having gone to bed around 6am. After they left, we started a boules competition, duly won by Michel and Eric. To round off the evening, we all went up to the salle de fêtes for a few beers, accompanied by the now rather knackered banda, before returning to scoff the last of the food by candle light. 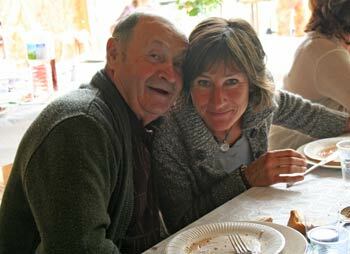 Austyn and Nick went off to stay in a gîte in the Pyrenees National Park. So we decided to take leave and join them for a day of walking. It was a glorious day and we climbed past the lake of Estaing, picnicked next to a mountain stream and even spotted Griffon vultures circling above us along the peak. Our small pond is fed by rain water from the roofs of the house and barn. Unfortunately, it also gets covered in algae and blanket weed in the summer since it has no natural cover. 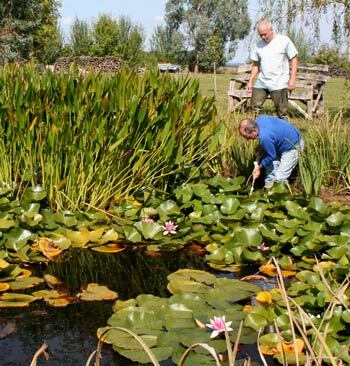 Our friends Ian and Pam have a beautiful pond with water lilies and irises which keep the water clear. Having borrowed thigh waders we went over to take some cuttings. Ian and Perry waded in and managed to pull some free. We now have pink and white water lilies and white irises in our pond. Hopefully they will take and give it the cover it needs to be healthy. That way we can use the pump without the filter blocking every few days. 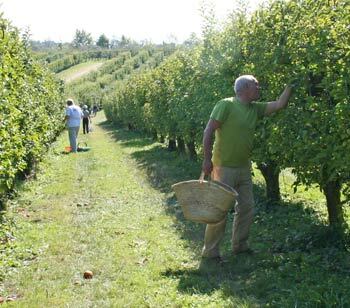 Our neighbours, Jean-Luc and Isabelle, invited us to join them picking apples. They go each year to the same family business, in the Gers. Arriving, we saw enormous rows of trees undulating over the hills. Stepping out with our assorted baskets, we quickly filled them with ecological, untreated apples. Perfect for eating and cooking. Arriving home with 28 kilos, we will be eating at least one apple a day and Perry will be making a lot of tartes tatins. 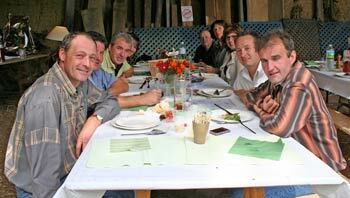 © 2008 Perry Taylor and La Baguette Magique, France.